How can it be that 6 years have passed since I sat with you at Drew’s birthday party, then later sat and talked into the night……I miss you. How did I not know that time counted in hours would change every aspect of my life, leaving a hole in my heart that won’t heal? The phone call from your sister telling me you couldn’t be found should we call the police? Yes…I’m on my way to you, hours of driving with thoughts of finding you and asking why did you worry us, what were you thinking? Me determined to find you and ask, knowing that together we could figure out any problem, we could find solutions…..never thinking that six years later I’d still be searching, wanting so badly to bring you home. I think you know, you know that I’m looking for you, that I won’t quit, that even as I search for others that need to be brought Home you are there with me. I’ve wondered over the years would you approve, and God gifted me with peace that allowed me to know that you do, and some days I can feel a special warmth that lets me know you’re close, and on those days I can see your smile, and hear your “oh mom” as you laugh, cause I should know you would. I knew your heart, but didn’t always understand your pain. Height 5' 8" / Weight 180 lbs. We have searched the area but found nothing”. “The pawn shop clerk said the gun barrel was protruding from the duffle bag when he left the shop. As busy as that area is midday, we think it is likely someone saw him and would remember something as unusual as a young man walking on Blanding or 103rd with a gun in a duffel bag”, the missing man’s sister said. 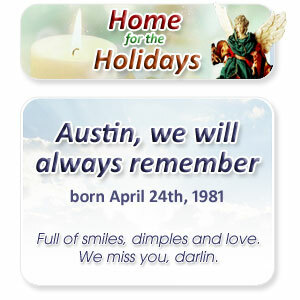 Austin is now listed on America's Most Wanted as a missing person. As the family of a missing Adult, I can tell you our local governments are not staffed, funded or otherwise resourced to adequately aid families in search of missing loved ones. Jacksonville FL Sheriff's Office receives 6000 missing person reports annually and has only four detectives to investigate the cases. Organizations like the National Center for Missing Adults are key and essential to our plight and bring resources and hope to many families like ours. Please click on the link below, sign the petition, write your representatives in Congress and forward this information to others. The Squeaky Wheel starts here. . .with me, with you. . .we have the power to make a difference both individually and collectively. We are the families of the missing, the artists and communities who care about the missing, the non-for-profit organizations dedicated to the missing, and the media who sees that attention is needed to bring someone home. Join us - attend a concert, spread the word, and help us bring the missing home!